"When one seeks imperial power, there is no mean between the heights and the abyss." "RIP, American Dream? Why It's So Hard For the Poor to Get Ahead Today"
Matthew O'Brien. The Atlantic. 18 June 2013. It is a good article, but an incomplete one. Unlike many other attempts to explain why America has separated into classes distinct and impenetrable, Mr. O'Brien does focus on the factors that matter most. What he misses is why these developments have taken place. America's poor (and their children) have little hope of becoming rich; her rich (and their children) face little fear of becoming poor. Three words missing from Mr. O'Brien's piece hep explain why this is so: economies of scale. "But high-earners aren't just earning more today; they're also marrying each other more. It's what economists romantically call "assortative mating" -- and Christine Schwartz, a professor of sociology at the University of Wisconsin, estimates inequality would be 25 to 30 percent lower if not for it." Lets review why this fact is so critically important to understanding the broader story of America's class. In America, class is a matter of education. The more education you receive, the richer you will be. It is a narrow funnel from which to form a ruling class. "Together, just 10 schools took 20 percent of all the students in the United States who scored in the top five centiles on the SAT or ACT. Forty one schools accounted for half of them. [The 105 most selective American colleges], which accounted for 19 percent of all freshmen in 1997, accounted for 7 percent of students with SAT or ACT scores in the top five centiles." This is not a projection of the distant future. This new world is already a generation old. The wealthy, high-IQ, elite-school alumni who marry today are, by and large, the children of wealthy, high-IQ, elite school alumni who married each other a generation ago. This cognitive sorting of the American people is the root of America's current class divides. "It's less clear why higher education isn't more of a path to prosperity for low-income children. Well, what kind of higher education are we talking about? As Caroline Hoxby of Stanford and Christopher Avery of Harvard show in a recent paper presented at the Brookings Institute, very few high-achieving students from low-income households end up even applying to a selective college. (Here, "high-achieving" is defined as the top 10 percent of overall test-takers on the SAT I or ACT, and a "selective" college is one of the top 236 schools in the country.) 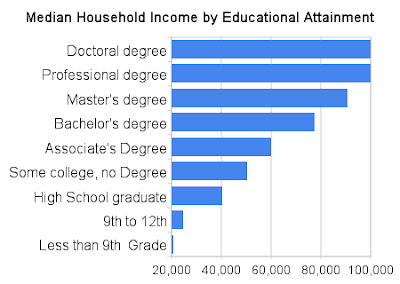 This, of course, is not how high-achieving, high-income students play the college admissions game. They follow their guidance counselors' advice, and apply to a few "reach" schools, a handful of "match" schools, and a "safety" school or two. This is how the American Dream ends. Not with a bang, but a whimper of elite school applications by poor kids. Like it or not, the Ivies and other top schools are our conduit to the top, and far too many low-income students who should be there are not. As David Leonhardt of the New York Times points out, only 34 percent of high-achieving, low-income students attend a selective college versus 78 percent for high-achieving, high-income students. This has to be the most boneheaded way we as a society perpetuate the people at the top. The deck is already more than stacked against kids growing up in low-income households -- their parents often aren't as involved or even around -- and we're not helping the ones who do succeed to succeed more." As Mr. O'Brian suggests, more important than the money spent on each child is the disparity between the human resources rich and poor children have access to. Here again elite sorting is at play. This culprit is not whom the elite marry, but where they choose to live once the knot is tied. Much attention has been paid to the "big sort" of the American populace into like-minded populations of conservatives and liberals who live physically apart. Less trumpeted about has been the geographic separation by class - a big sort of rich and poor, each living in their own neighborhoods, both minutes and worlds apart. The problem has worsened considerably over the last 60 years. The geographic isolation of America's upper crust compounds the problems of America's intelligence divide. Poor children in inner city or rural school districts do not have access to teachers, counselors, or community leaders who know how to play the elite university game because those teachers and counselors do not live in poor inner city or rural school districts. Even those from lower class backgrounds who manage to beat the odds and fight their way to the top do little for the communities they came from. Once they leave they rarely come back, settling down in rich neighborhoods with the rest of their class. Money follows the same pattern: the districts most in need of extra funds are those who lack wealthy citizens to draw these funds from from. 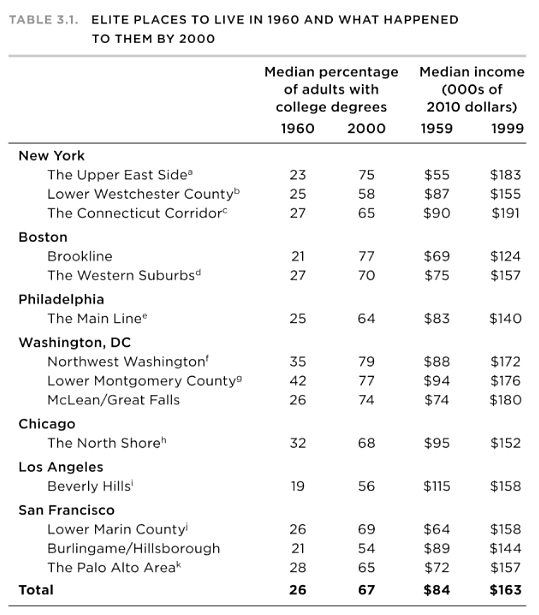 Patterns in settlement and marriage account for the most stunning of America's entrenched disparities. Perceptive observers like Matthew O'Brien recognize this, but they do not explain why these patterns came about. To do so requires a deeper look at the structures of American power. Once again the Ivy League is a useful place to begin. We noted earlier that the Ivy League of the early twentieth century was dominated by the wealthy. Wealth was not the only thing that united Ivies of that day. Those who went to the elite schools in the Northeast were almost entirely from the Northeast. Elites from other regions stuck to schools within the region - why travel to the far away lands of the Ivy League when schools like Stanford, University of Chicago, Duke, or somewhere else closer to home offered the same prestige and better connections? There was no single funnel through which the nation's elite were picked and primed. This reflected the realities of contemporary society. America did not have one set of elite schools for its national elite because the United States did not yet have a single national elite. The United States was born a republic of free-holding farmers. The township was the world of the New England man; the county was the center of Southern life. Few businesses had boundaries larger than this. Government power was concentrated at the bottom. Larger government structures existed, but their impact on daily life was negligible. National hierarchy arose in times of war - but once the war ended American life scaled down to normal, decentralized and parochial as before. Viewing the scene with an outsider's eye, Tocqueville quipped "The striking thing about the United States... is the rarity of lofty ambitions evident in this land where all are activley ambitious." He was right. Americans spoke of their ambitions with words like "independence", "self improvement" and "obtaining a competency." No one aimed to climb the social ladder and join the upper class. As far as most Americans were concerned there was no other class than that which belonged to all white men. Alas, the system was not to last. By the late 1800s transformations in transportation, industrial methods, and communications made industrial ventures that spanned the Union possible. The rest of the nation was not eager to industrialize, throwing up cow-boys and populists to try and slow titanic industrial conglomerations down. But continuing industrialization could not be stopped, and soon the opponents of industry were organized on a similar scale as their declared enemies. The turn-of-the-century progressive reforms and the rise of massive labour unions were the first steps along this path. The full transformation came with President Franklin Roosevelt. The fight to end the Great Depression and (more importantly) emerge victorious from the Second World War changed the face of American society. Business changed from the government's enemy to its closest friend, and both ballooned in size. During the war the entire population was mobilized and economy centralized to meet the demands of victory. The pattern proved successful. Economies of scale and a vast national hierarchy won the war. They were here to stay. Facing a cold war of global proportions, American statesmen decided to defy the usual tradition of scaling down after victory. The United States would stay on permanent war footing. The vast system of international hierarchies built up during the war would be maintained and improved; those helming these hierarchies - a strange mix of CEOs, politicians, generals, and career bureaucrats - would regularly make decisions whose impacts would resonate across the globe. "The economy-once a great scatter of small productive units in autonomous balance-has become dominated by two or three hundred giant corporations, administratively and politically interrelated, which together hold the keys to economic decisions. The political order, once a decentralized set of several dozen states with a weak spinal cord, has become a centralized, executive establishment which has taken up into itself many powers previously scattered, and now enters into each and every crany of the social structure. The military order, once a slim establishment in a context of distrust fed by state militia, has become the largest and most expensive feature of government, and, although well versed in smiling public relations, now has all the grim and clumsy efficiency of a sprawling bureaucratic domain. In each of these institutional areas, the means of power at the disposal of decision makers have increased enormously; their central executive powers have been enhanced; within each of them modern administrative routines have been elaborated and tightened up. That was in 1959. Since then the scale has only gotten larger. America's population boomed from 150 million in 1950 to 314 million today. While civic associations and smaller government structures withered away, the federal government has expanded to touch almost every aspect of daily life. The reach of the executive branch stretches across continents, allowing officials to spy on, freeze the funds of, or assassinate men living thousands of miles away. The scope of the market has expanded even faster. American business now pays, caters to, and collects data on billions of people. It is a lot of power held by a small number of hands. Whose hands should they be? Meritocracy seemed the only solution. James Bryant Conant was one of the main architects of the modern meritocratic order. President of Harvard from 1933 to 1953, Conant labored diligently to transform Harvard from a New England country club with a library to a world class university who pulled a carefully slected caste of elite scholars from across the country. 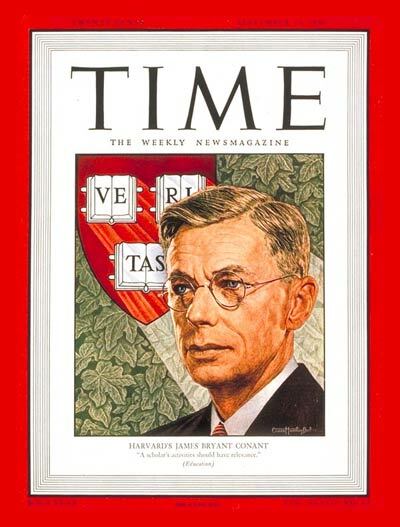 Mr. Conant's ambition's were larger than Harvard Yard; he hoped his reforms might change the face of American education. His hopes were more or less realized. He played an instrumental role in elevating the Scholastic Apptitutde Test (SAT) to national prominence, and he was chair of the Harvard Comittee, whose report "Objectives of General Education in a Free Society" set forth the pattern and principles of the GE system that dominates American undergraduate education today. Time Magazine's cover, 26 September 1943. "In his brief autobiographical sketch Jefferson wrote that he deemed it essential to a well-ordered republic to annul hereditary privilege. He proposed 'instead of an aristocracy of wealth, of more harm and danger, than benefit, to society, to make an opening for the aristocracy of virtue and talent, which nature has wisely provided for the direction of the interests of society, and scattered with equal hand through all its conditions....' Elsewhere, in describing his new educational scheme for Virginia, he speaks of that part of his plan which called for 'the selection of the youths of genius from among the classes of the poor.' He declared, 'We hope to avail the State of those talents which nature has sown as liberally among the poor as the rich, but which perish without use, if not sought for and cultivated.' These quotations sum up for me the second component in the Jeffersonian tradition in education—a sincere belief in the paramount importance of careers freely open to all the talented." "Let me pause a moment to examine the phrase 'social mobility,' for this is the heart of my argument. A high degree of social mobility is the essence of the American ideal of a classless society. If large numbers of young people can develop their own capacities irrespective of the economic status of their parents, then social mobility is high. If, on the other hand, the future of a young man or woman is determined almost entirely by inherited privilege or the lack of it, social mobility is nonexistent. You are all familiar with the old American adage, 'Three generations from shirt sleeves to shirt sleeves.' This implies a high degree of social mobility, both up and down. It implies that sons and daughters must and can seek their own level, obtain their own economic rewards, engage in any occupation irrespective of what their parents might have done. ...The distinction between a stratified class system and one with a high degree of social mobility is apparent only when at least two generations are passed in review. A class, as I am using the word, is perpetuated by virtue of inherited position. For one generation, at least and perhaps two, considerable differences in economic status as well as extreme differentiation of employment may exist without the formation of classes. Uniform distribution of the world's goods is not necessary for a classless society. If anyone doubts this statement, let him examine the social situation of many small communities in different parts of this country during the early stages of their development. Continuous perpetuation from generation to generation of even small differences, however, soon produces class consciousness. Extremes of wealth or poverty accelerate the process.... if the American ideal is not to be an illusion, the citizens of this republic must not shrink from drastic action. The requirement, however, is not a radical equalization of wealth at any given moment; it is rather a continuous process by which power and privilege may be automatically redistributed at the end of each generation. The aim is a more equitable distribution of opportunity for all the children of the land. The reality of our national life must be made a sufficiently close approximation to our ideal to vitalize a belief in the possibility of the envisaged goal. ...Political and economic changes must go hand in hand with educational innovations—the revision of methods of perpetuating control of many large industries, the overthrow of nepotism and patronage wherever possible, the stimulation of small enterprises, the spreading of private ownership. All this and more is needed if a free classless society is to become once again an ideal which affects our lives. It is notable that Mr.Conant had to define "Social mobility." The term was a fairly recent phrase - invented at the turn of the twentieth century but only reaching prominence when heairachial structures of power began to solidfy in the 30s and 40s. Google Ngram results for "Social mobility." Evan Applegate. 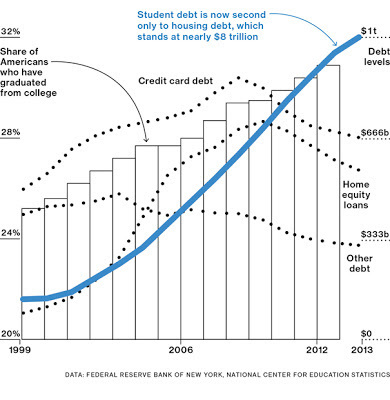 "Correlations: Student Debt Explodes." Business Insider. 27 June 2013. Millions of parents desperatley wish their children could say the same. Thus the extreme measures America's upper class take to shape their kids into excellencce: baby Einstein, forced violin lessons, private tutors, gold medal sport teams, pre-test prep followed by pre-test tests. Is it any surprise then to learn that ten times the money is spent on America's rich kids than are spent on America's poor ones? If America is to have "an aristocracy of talent" then the ruling class is going to do everything they damn well can to ensure their kids are talented enough to be a part of it. The stakes are too high to expect anything else. The attempt to channel this fierce struggle for the heights of wealth and power through a national education system explains the concentration of America's smartest and most ambitious. But the wicked marriage of meritocracy and economies of scale bears a more subtle cost. Let us return to the essay we started with, "RIP, American Dream." 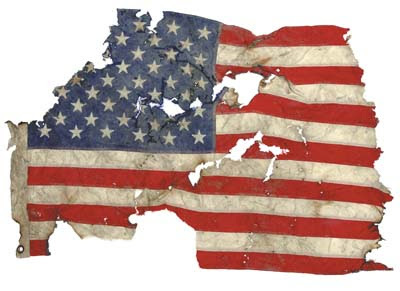 Why does Mr. O'Brien say the the American Dream died? "This is how the American Dream ends. Not with a bang, but a whimper of elite school applications by poor kids. Like it or not, the Ivies and other top schools are our conduit to the top, and far too many low-income students who should be there are not." (emphasis added). James Bryant Contant's vision has become today's orthodoxy. The American dream has been reduced to a climb up the social ladder, the advance of the elect from one class to another. When we define the American Dream as "reaching the top" we restrict it to a very small number of people. The old American ideal of a free republic of self governing communities composed of self governing men fades away. American Dream? What was once a dream of democracy and improvement has degraded into a fight over who is allowed to join the governing class. Like all phrases of its type, the "American Dream" is an idea. Ideas don't die when they are frustrated. They die when people forget what they mean. Economies of scale killed the American Dream. For an excellent example, see Karen Ho's description of the Wall Street recruitment program in Liquidated: An Ethnography of Wall Street. (Durham, NC: Duke University Press). 2009. p. 39-73, esp. p. 64. A grad student at Harvard Business School once explained to me how important "connections" were to the students there when I asked him about the quality of the courses he took: "Pretty much everybody here acknowledges that Harvard Business School is not really about the courses, but the people we will meet when we are here." For Wall Street statistics, see Karen Ho, Liquidated, p. 44, for quotas, p. 65; for Senators, see the data collected and presented in T. Greer. "Cases in Plutarchy? U.S. Senate by Graduating Institution." 30 April 2010; for billionaires, Jonathan Wai. "The Scary Smart are the Scary Rich." Forbes. 24 September 2012; data on the cabinet was collected by myself, based on each member's wikipedia page. Rebecca Strauss. "Schooling Ourselves in Unequal America." New York Times. 16 June 2013. There is a weak correlation between money spent on education and benefits reaped. See the graphs in Dan Lips, Shanea Watkins, and John Fleming. "Does Spending More on Education Improve Academic Achievement?" Heritage Foundation. 8 September 2008. Even so, the way we spend our money clearly betrays our priorities. See Chart 1.2 in Kevin Phillips. Wealth and Democracy: A Political History of the American Rich. (New York: Broadway Books). 2000. p. 23. Harry L. Watson. Liberty and Power: The Politics of Jacksonian America. 2nd ed. (New York: Hill and Wang). 2006. p. 33. Alexis de Tocqueville. Democracy in America and Other Writings. Trans. Gerald Bevan. (New York: Penguin Books). p. 728. He continues: "There is not a single American who is not eaten up with the desire to better himself but you meet almost no one who appears to cherish very great hopes or to aim very high. All constantly wish to acquire material possessions, reputation, and power; few have a lofty conception f these things." Examples of these terms in early American discourse are too numerous to bother citing here. Those wishing to understand the gist of each term are advised to consult the following: On "independence" see Eric Foner. The Story of American Freedom. (New York: W.W. Norton and Co.) 1999. p. 3-69; on "improvement" see Daniel Walker Howe, What God Hath Wrought: the Transformation of America, 1815-1848 (New York: Oxford University Press). 243-285; on "competency" see Christopher Lasch, "Opportunity in the Promised Lan: Social Mobility or the Democratization of Competence?" in The Revolt of the Elites. (New York: W.W. Norton and Company). 1995. p. 50-79. Kevin Phillips. Wealth and Democracy: A Political History of the American Rich. (New York: Broadway Books). 2000. p. 71-73; 81. To say nothing of the ten million people serving in the armed forces--whose families made up 1/4th the nation--and whose entire lives were constantly subject to the direct control of bureaucrats and generals. C. Wright Mills. The Power Elite. (New York: Oxford University Press). 1959. p. 7-8. "2014 Ivy League Admissions Statistics." The Ivy Coach. Last updated April 2013. For a comparison with non-Ivy league elite schools, see Kayla Webley. "Ivy League Schools: Acceptance Rates Decline." Time. 4 April 2013. Hadley Malcom. 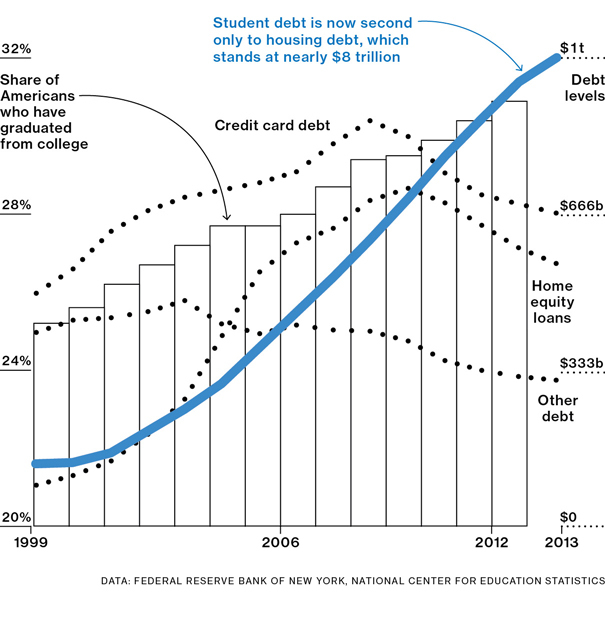 "Millennial Ball and Chain: Student Debt." USA Today. 30 June 2013. Devon Peterson. "The Allure of Elite Jobs." Daily Princetonian. 16 October 2003. Yale professor Amy Chua provides a wonderful example of just how extreme these pressures can be. "Why Chinese Mothers Are Superior." Wall Street Journal. 8 January 2011. Of course, the competition is even tougher for Chua and her children than for normal Americans, as the admission process has a proven bias against Asian Americans. See Robert Unz, "The Myth of American Meritocracy." American Conservative. 28 Novemeber 2012. Christopher Lasch. The Revolt of the Elites. (New York: W.W. Norton and Company). 1995. p. 78-79. Normative claim: We want a society in which there is a more equal distribution of power than is currently the case. Descriptive claim: Economies of Scale concentrate the power into a really small space, and Meritocracy is the system by which people compete for this space. In this competitive environment, the socioeconomic-cognitive elites find themselves pushed into close proximity, and this only intensifies their capacity to become more elite and to produce cognitively and socioeconomically elite children. Prescriptive claim: Decentralization will spread the power over a greater space, making meritocracy easier. Yep. I suppose I did not give many reasons for why I am making such a claim (that would be a post in and of itself...) but I did allude to one: any society that has a great disparities in power will eventually have great disparities in wealth. Be it through bail outs, corruption, self seeking regulations, or well funded elite colleges, those with power will game the system so that their wealth matches their power. "Aligning success and opportunity with social mobility/meritocracy has changed the over riding aim of social policy from actually helping the great body of the citizenry improve their lives to 'merely promot[ing] a broader recruitment of elites.' "
As Lasch suggests, debates over affirmative action are wonderful (perhaps horrifying?) examples of this. Affirmative action is great for the top decile of minorities who qualify for it - it will change their lives. But what about the people they leave behind? What about those people who simply are not smart enough to be part of the elite? Affirmative action allows the upper class to feel good about being diverse and open minded without having to actually bother helping (or interacting with) the vast majority of blacks or hispanics who don't like to read, actually watch Jersey Shore, and probably have a family member in prison. When you define success as reaching the top, then those people will never have it (so why help them anyway?). Prescriptive claim: Decentralization will spread the power over a greater space, making meritocracy less competitive. I might switch from less competitive (which is true!) to less relevant. Decentralization makes the elite much less relevant. By extension, the focus will shift away meritocracy and towards helping the people become prosperous and fully involved citizens. (And on that note I am going to veer a little off topic: This is one of the worse parts of the economies of scale/meritocracy marriage - it carries with it the idea that only the people smart/hard working/talented enough to reach the top deserve to influence politics. Back in the 1800s, rich southern aristocrats would complain that the poor farmers around them could only talk of two 'mundane' things: "agriculture and politics." No one would say the same today! The difference was that back then poor and middle class people were expected to be citizens. And a lot of the machinery of government was close enough to them that what they did really mattered. So they stayed informed (enough) and were actively engaged in their own communities. People only learn to do things that are relevant to their lives. When politics stopped being relevant to American's lives, they no longer bothered learning how to do it. Decentralization might just make these things relevant again). The current situation is a result of government power choking off economic opportunities. We have a rentier system, where all major decisions are made politically. Disruptive technological change displaces and churns up elites. The current ruling class has created a narrow funnel to create barriers to entry and preserve their franchise. But they are rotten custodians of the country. They will attempt to prevent the creative destruction that is coming, but they will fail. The existing government is going to go broke and the technological changes which are coming cannot be stopped. The type of stasis you depict is not an end state it is a temporary stage. Their self congratulation about being very, very smart is mostly misplaced. Getting the credential requires being smart at getting grades and credentials, with little actual application, as you note. It is a membership card, not preparation for adding value. The high IQs of most of these people are being wasted. The finance industry is based on government manipulation of the money supply, not creating value. People who are street smart will have a lot more opportunities as the current regime weakens. The mix of arrogance and ineptitude of this ruling class will make some grimly amusing reading in the histories of the future. But few people who were not dealt into that rigged game will miss it. Thanks for the comment LFC, and the book recommendation! I agree that labor unions were an important part of the inequality story. One of the big takeaways from Timothy Noah's great series on inequality is that there is no single reason for economic inequality. But there are two inequality stories: the bridge between the poor and the well off (top 20%) and the bridge between the well off and the super well off (top 1%). I think labor unions had much more to do with the first than the second. And declines in social mobility - which is really what this post is about* - can only be indirectly related to labor unions or things of this type. *Well, that is not really true. This post is not really about the division of wealth at all - it is really about the division of power. Inevitably the second will create the first and mobility will go down with it. Their line "In a meritocracy, the whole point of having “merit” is that you can run things (“ocracy”), and the point of running things is that you can get good jobs for your family and friends." hits the nail on the head. It seems I'm 2+ years late to the conversation, but I wanted to hear your thoughts on the global elite, especially now that you've spent some more time living in East Asia. I like to call them the "Monocle" class - those who can read Monocle with purpose because they are reasonably likely to end up in Lisbon (where they decide to buy an artisan chair to be shipped back to their home), then a month later find their knowledge of the Japanese fishing industry relevant and worth bringing up in conversation over an exquisite meal at the most exclusive boutique hotel in Tokyo. American elite universities long ago achieved their goal to mine the children of local/state elites for potential national elites. Less discussed is the process of shaping the identity of the global elite by accepting the children of national elite all over the world.